Its a weird phenomenon to us. Today in June 22nd here in Australia, June 21st in many other parts of the world. For those for which it is June 21st, it is the longest day of the year. For us, yesterday on June 21st, it was the shortest day of the year with the least amount of daylight. Its now winter here. The longest day of the year in Australia will be December 21st when summer begins. In our old lives, we never gave any of this a thought. We lived our lives with a calendar commensurate with what we saw when we looked out the window; all four seasons with June being the beginning of the short Minnesota summer months. By late August the leaves began to fall, the temperatures quickly began to change and less than two months later, we would turn on the furnaces and prepare for the long winter months. On occasion it snowed on Halloween with the trick or treaters wearing coats over their costumes, the house becoming chilled each time we opened the door to hand out the candy. That was our old life. This is our new life. The high humidity is a perfect climate for mushrooms. Its Monday morning here. Sunday afternoon, we took a drive looking for the fitness club that I plan to join in a few days. I've put this off since we arrived 10 days ago and the time has come for me to face the music. Its so easy to lose the momentum for working out. I worked out on the ship but most likely lost a certain amount of my fitness level by missing over a week. With the high intensity interval training I do once every six days as recommended by scientific research, with lots of walking and activity, I am not as far behind as I may have been in my old style of working out five times a week, an hour and a half each time. Those days are long gone. It was tricky finding the fitness center which was closed by the time we arrived. Like typical seniors, we like to scope out where what we're looking for in the area. We've already noticed that driving directions may be off in this area when using online maps. After navigating a few roundabouts (common in Australia), we finally found it and hope to return tomorrow so I can join and do my first workout. Now as we reflect, we don't think we had jet lag. In reality, we were off an entire day after crossing the International Dateline plus a few hours. Not enough to cause jet lag. The entire one day time difference wouldn't result in jet lag. Its just a different day on the calendar. In any case, we're back to our "old" selves, cheerful, feeling great and anxious to see more of our immediate surroundings. We spotted these White Ibis on the front lawn of a house near the fitness center. Australia is considered one of the most expensive areas to live and visit in the world. As we've investigated what we hope to do we've decided it makes sense to stay within a day's drive of our current location. Investigating trains to other larger cities, the cost for a round trip 24 hours train ride with a modest reclining sleeper was US $1165, AUD $1500 (for two, round trip). By adding the cost of accommodations, other transportation, dining out and various tourist venues a three day visit could easily cost US $2500, AUD $3216. The beak on White Ibis is long and hooked, ideal for catching fish. Driving the same distance would take six days round trip plus the cost of gas, accommodations, meals and venues and result in our being gone for nine days. Paying rent for our house in Trinity Beach makes no sense for us to be gone for nine days. Our budgetary concerns must always prevail. Instead we've booked several cruises that travel around the continent allowing us to "live" on the ships with no other rents paid at that time and to see the majority of the larger Australian cities on tours. For us, this is an economical and logical alternative. In the interim, there's an abundance of sights to see within a one day drive in this amazing area with beautiful weather during its winter months. Today we awoke to exquisite sunshine and ideal temperatures. 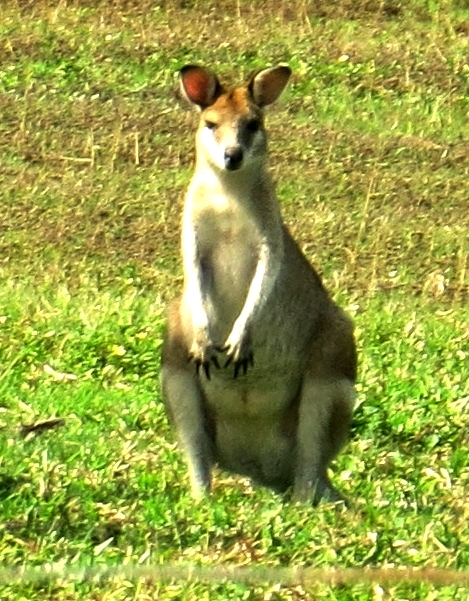 in Kauai so I won't go overboard with kangaroo photos. I can't wait to see a "joey"
As soon as I upload today's post, we're off to Woolie's and the farmer's market. We're literally out of any options for tonight's dinner. The last time we shopped was six days ago and with the tiny freezer stocking up for longer periods isn't possible. Tomorrow, we'll post a photo of our receipts. However, we have no concerns that this will be an issue for us. We try to make each planned meal last for no less than two nights, made fresh each day. When we enjoy our meal as much we do we actually look forward to repeats. Again, Happy Father's Day to all the dads out there on the opposite side of the International Dateline including our two sons, both of whom are great dads and to whom we send our utmost love and affection. Water in the creek in Campanario, Madeira after a night's heavy rains. For more details of our life in Madeira, one year ago, please click here.